With the Adelaide Crows in pole position to take out the AFL flag for the first time in 19 years, it’s a hell of a time to be an Adelaide sports fan. Just ask Adam Scott who, after managing to get a break from ‘daddy duties’, got to soak up the first round of finals action live in person. The native South Australian had one night to spare in Adelaide last week after the birth of new baby boy Byron brought him home early. The former US Masters champion spends most of his year on the US PGA Tour, returning to Australia only during the summer months. “Unfortunately, my golf season clashes completely with the footy season, but I follow from afar,” said Scott. Seizing the opportunity, the lifelong Crows fan made a whirlwind trip from Queensland to Adelaide to arrive just in time for the opening bounce. 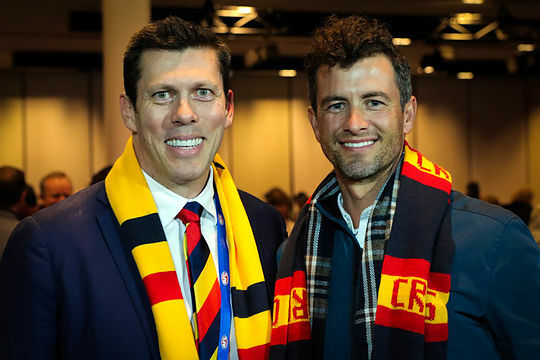 Due to fly out early the next morning, the 37-year-old spent the waking hours at Adelaide Oval with father and fellow Crows’ supporter Phil. It was a trip the former world No. 1 was all too happy to make. “I got to sneak out and take a night off nappy-changing to come and watch the guys play,” said Scott. Born in South Australia, Scott is a Crows ambassador and lifelong fan. He said footy was his first sporting love as a child before picking up golf in his later years. Attending his first game in more than a decade, Scott and his father couldn’t have been more delighted with the result. “I was excited to come down and watch Eddie (Betts) play and he hasn’t disappointed,” said Scott after the match.